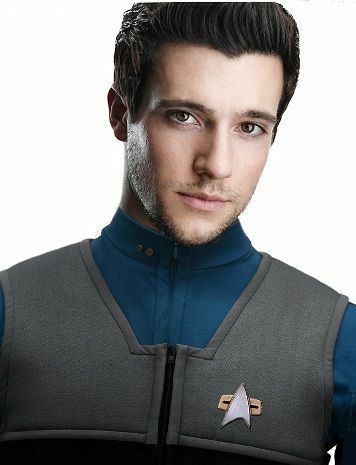 In 2376, Lieutenant Candlewood served on Deep Space 9 and aboard the USS Defiant as a computer specialist. He was part of the Defiant's crew when Commander Elias Vaughn took the ship on a three month tour of exploration in the Gamma Quadrant. In the second week of the mission, the Defiant encountered the Vahni Vahltupali. After a successful first contact, the Defiant was about to continue it's mission when the Vahni's moon was inadvertantly destroyed by the Inamuri. Candlewood and Ensign Prynn Tenmei were assigned to the type-10 shuttlecraft Chaffee as part of the efforts to prevent larger fragments of the moon from impacting the Vahni's homeworld. Candlewood operated the sensors and weapons while Tenmei piloted the shuttle. Later in the Gamma Quadrant mission, Candlewood suffered a minor plasma burn in engineering that coincided with the crew's encounter with the mysterious "Cathedral" artefact. He was therefore in the Defiant's sickbay when Doctor Julian Bashir became affected by the artifact. When Bashir accidentally fumbled in his use of a laser scalpel, he inadvertently impaled Candlewood through the leg with the device. As Bashir's mental faculties continued to deteriorate, Commander Vaughn pressed Candlewood into service as a companion for Bashir, pretending for Bashir's sake that Candlewood needed his medical supervision much more than he actually did. Eventually both Bashir and Candlewood recovered fully, and Candlewood temporarily aided in sickbay when emergency surgery was required upon Lieutenant Ezri Dax. Candlewood had wanted to transfer to sciences for a while but it was not what he hoped for when he was assigned to the Constitution class Enterprise now a training vessel as the Assistant Chief Science Officer.